1. Cigarette consolidation: The owner of Lucky Strike wants to add Camel and Newport to its pack. British American Tobacco (BTI) on Friday announced a $47 billion bid to take control of fellow cigarette giant Reynolds (RAI). Shares in Reynolds are surging by about 18% premarket. BAT already owns about 42% of Reynolds. But it says its willing to shell out $47 billion to buy the remaining 58%. 2. Market movers -- Microsoft, PayPal: Shares in Microsoft (MSFT) and PayPal (PYPL) are powering higher in premarket trading after both companies reported well-received earnings on Thursday afternoon. Microsoft shares are set to hit an all-time high when trading opens, surpassing the $60 mark for the first time ever and exceeding a previous high set during the dot-com boom in 1999. 3. Rebound time: Shares in Deutsche Bank (DB) continue to rally from recent lows and are up another 1.5% Friday. The stock has now fully recovered from a major selloff that was sparked in mid-September when the the U.S. Justice Department announced it wanted the bank to pay $14 billion over allegations it packaged up toxic mortgages. Deutsche Bank previously said it has "no intent to settle these potential civil claims anywhere near the number cited." Shares in Mitsubishi Motors also rallied 5% in Tokyo on Friday after the troubled Japanese automaker announced that Nissan had completed its planned $2.3 billion investment. Nissan is now officially the biggest shareholder in Mitsubishi, and Nissan CEO Carlos Ghosn is taking on the role of chairman at Mitsubishi. Mitsubishi admitted earlier this year that it had fudged fuel efficiency tests for a wide range of vehicles, causing shares to tank to all-time lows. 4. Earnings: McDonald's (MCD), General Electric (GE) and Honeywell (HON) are releasing earnings before the opening bell on Friday. Automaker Daimler (DDAIY) also released results Friday. Telecom firm Ericsson (ERIC) released quarterly results that came in below analyst expectations. Shares are down 4% in Europe. 5. 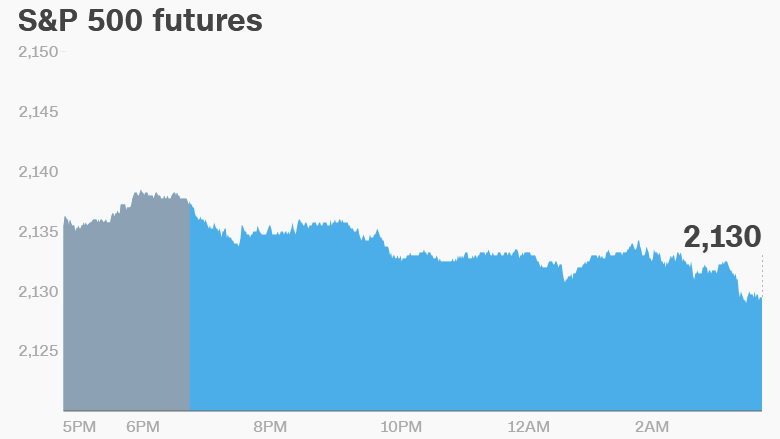 Global market overview: U.S. stock futures are pointing lower. The Dow Jones industrial average, S&P 500 and Nasdaq each declined by 0.1% to 0.3% over Thursday trading. European markets are mixed in early trading. Most Asian markets ended the day with losses. Hong Kong's market was closed due to a typhoon.